England will return to the scene of the 10-ball Test match when they play in Antigua on their tour of the West Indies next April. The schedule for the three Test series was revealed following some political wrangling - an England Test is extremely valuable to Caribbean islands heavily reliant on tourism - with Barbados and Grenada the other venues. 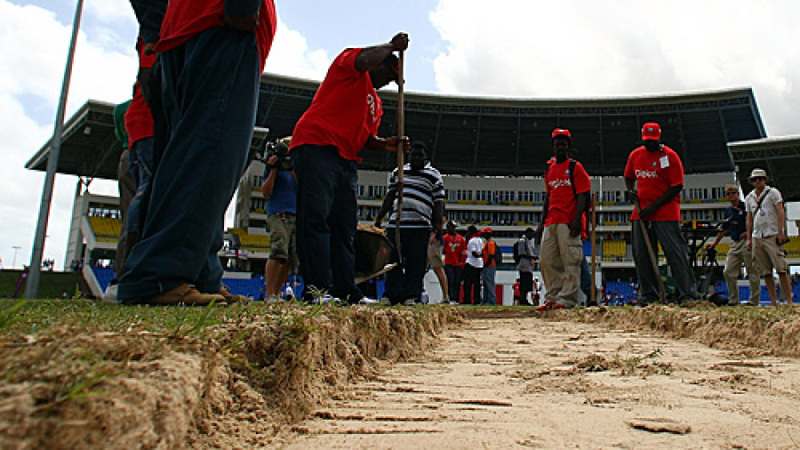 In 2009 the Antigua Test at the Sir Vivian Richards Stadium was abandoned after only 1.4 overs with the sandy outfield deemed a safety risk to the players. A replacement match at the Antigua Recreation Ground was hastily arranged which was thrillingly drawn with West Indies nine wickets down. England returned to North Sound earlier this year during their limited-overs tour. Meanwhile, Grenada will stage its first Test since 2009. The National Cricket Stadium in St George's took over from the old Queen's Park ground as Grenada's international venue in 1999 but since then has only staged two Tests - against New Zealand in 2002 and Bangladesh in 2009. The ground has also staged 19 ODIs but England have never played on the island, meaning Grenada will welcome an influx of England supporters for the first time next April. England will also return to the Kensingston Oval in Barbados, a traditional favourite with the travelling supporters, where England were West Indies' first opponents in 1930. The teams played three T20s on the ground in March. "We know the venues will prove extremely popular with the thousands of cricket lovers who follow England to the Caribbean," Paul Downton, Managing Director England Cricket, said. "It will also be exciting for many to visit the new venue of Grenada for the first time." The West Indies tour is part of a packed 2015 for England which is likely to see them playing in every month of the year. They will be in Australia and New Zealand from January to March for the World Cup and a warm-up triangular series, then after visiting West Indies they host New Zealand at home before an Ashes series. Later in the year they are scheduled to play Pakistan in the UAE before a tour of South Africa. A further indication of England's heavy workload is that three days after the final West Indies Test finishes they are set to play Ireland in an ODI in Dublin on May 8.